Although this year in April we only have one week school holiday to spend in Pizzo, we still came. Since we initiated a new renovation project - that started slowly due to diverse issues - it was now the time to push it forward: spring. Pizzitani tell me it was one of the coldest winter - yes, there was snow even in Vibo Valentia - and lots of rain. Indeed, it is still chilly here! But I had refused to pack winter clothes in my suitcase. 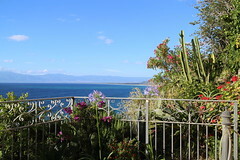 We were travelling to Southern Italy in spring, at least! But don't underestimate April in Calabria. (Sicily is more dry and warmer - yes it's further South too). So, we are wearing the 'onion look': layers of sweaters and jackets. But once the sun is out, it's lovely! However, we are here not for the dolce vita. There is work to do, lots of decision to make. 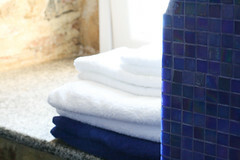 And so we end up spending hours to choose sinks, toilets and tiles! 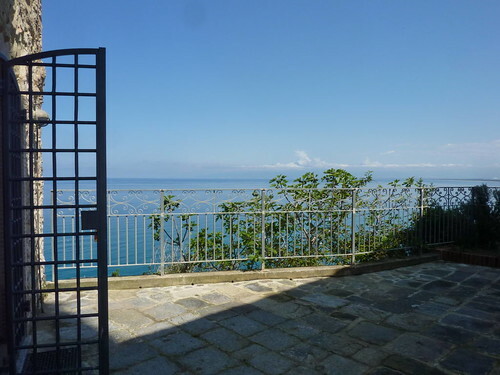 Whenever we are suggesting a holiday in Pizzo to our friends I realized how lucky we are in Pizzo (aka Pizzo Calabro or Pizzo di Calabria) being located so close to the international airport of Lamezia Terme (SUF). Lamezia airport brings thousands of passengers every year to Calabria in Southern Italy from around the world. There are business men among tourist on the daily Alitalia flights from Rome or Milan, but most tourists come with budget airlines which fly directly into Lamezia Terme (SUF) once or twice weekly from allover Europe and even overseas. I was impressed to find out from how many cities you can fly directly to Calabria, and of course vice versa, to where you can fly directly from Calabria. I am happy to share my list. Check with your airline during which months and which days direct flights are available. (Let me know, if I missed any city or airline). 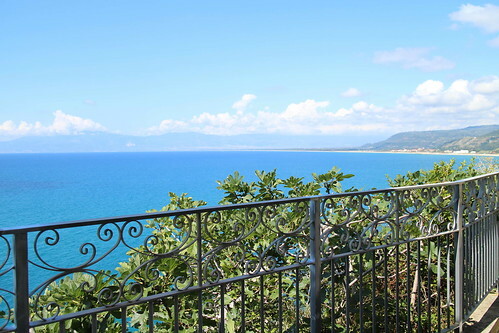 Pizzo is located just 25 km from Lamezia Terme airport, and can be reached by rented car or taxi in less than 30 minutes drive. 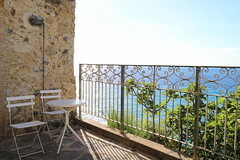 Tropea is located further down the coast, 60 km from the airport and about 1h 15min drive. The central train station in Lamezia Terme is about 1 km from the International Airport. There is a shuttle bus to the station. Some people with light luggage even walk along the road, but you could also hire a taxi. However, if your destination is Pizzo, we would recommend to take a taxi directly to Pizzo or pre-book a pick-up service (both around 40 Euro one-way to Pizzo). 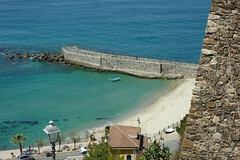 Pizzo is a great place to start to explore la bella Calabria. At the airport you will find different car rental services. You can pre-book a car online or book one at the airport. If you plan to drive into historic old towns, we recommend to rent a SMALL car as the alleys are very narrow. Please note, if you plan to just spend a relaxing holiday in centro storico di Pizzo, the old town center, no car is required for your holiday as restaurants, bars, shops, tourist sights and the beach are in walking distance. Other airports in Southern Italy: Reggio di Calabria, Catania (Sicily) and Naples. After daily checking Lamezia airport's website for arrival and departure, I update the list above accordingly. There are surprisingly many more direct flights than initially listed! Lufthansa's budget airline Germanwings is rebranding as Eurowings since fall 2015. The awesome view from the balcony, my absolutely favorite spot of the entire house! All began in 2006 when we were falling in love with an over 200 year old house on a cliff in Pizzo (Calabria), in the South of Italy. For several reasons it took us five years to renovate and decorate the palazzo. It's now our beautiful European home base, away from our expat home in Asia. And that's why I started blogging. 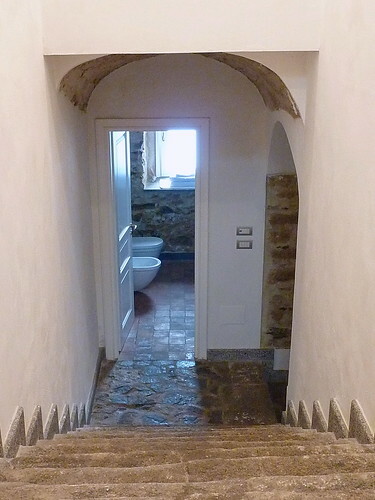 Follow our new renovation project "Casa delle Grazie"